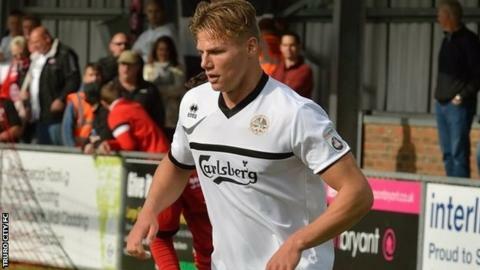 Truro City manager Steve Tully has praised the way midfielder Cody Cooke has turned his recent form around. Cooke scored his first goal this season Tuesday's draw at Weston-Super-Mare. "He had a disappointing game on Saturday and we took him off at half-time, but the way he responded on Tuesday was a credit to him. "He really stood up and said 'I'm here for the fight', and him and Aaron Dawson, have been the pick of our players," Tully told BBC Cornwall. Truro have 10 points from their opening 10 games and are 16th in National League South, having been promoted from the Southern Premier League last season. "I believe in the next 10 games we'll pick up a lot more points, but we've got to make sure we use our knowhow and football knowledge and see games out when we need to. "We'll get better as time goes on, the more the players get to know the league and the teams they're playing against and the way they play, we'll be OK.
"Last season it took us 10-15 games to get a strong, solid squad that you knew what would be from week to week, but we'll get there."